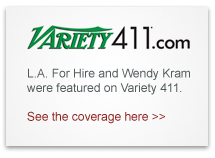 "Best Movie & TV Script Consultants" and #1 in Marketing"
L.A. FOR HIRE is a boutique consulting firm, created by veteran film and television producer Wendy Kram. With over 15 years of experience in the entertainment industry, Wendy has developed and produced projects with Oscar-winning talent for Walt Disney Studios, Universal, Warner Brothers, Sony Pictures, ABC, CBS, NBC, USA, HBO, Showtime, and Lifetime Networks. She has worked for companies that have produced films such as "Father of the Bride" and "Jacknife" with Robert DeNiro and Ed Harris and sold projects to talent such as Matt Damon and Ben Affleck. Wendy has created a company that specializes in connecting content to Hollywood talent and its key decision-makers. We handle everything from content development and talent recruitment to project management. Equipped with our own Rolodex of industry contacts, we work with motion picture studios, production companies, advertising agencies, directors and name talent to advance and market your projects. Our relationships with Hollywood’s decision-makers, and our excellent development skills, allow us to offer the best, up-to-date advice on how to take your project to the next level and increase its salability. For qualified clients, L.A. FOR HIRE is a gateway to the Hollywood community, providing industry access and exposure.